Update2: According to ABC7's Rob Elgas, the FBI is reviewing the circumstances surrounding the dismissal of criminal charges against Smollett. Update: Whether due to pressure from the entire world or simply deciding that her office's position would act judicially, State's Attorney Kim Foxx told ABC during an interview this evening that her "office did not ask that the court file be sealed, says it was done inadvertently and she believes it is in the process of being unsealed"
If she cannot, there must be an investigation into her misconduct. And even David Axelrod took to Twitter to express his disgust: "Unless some better explanation surfaces, here’s the lesson of this weird turn in the Smollett case: You can contrive a hate crime, make it a national news, get caught and-if you are a well-connected celebrity-get off for $10K and have your record expunged and files sealed." "The fact that (Smollett) feels that we have exonerated him, we have not. I can’t make it any clearer than that." So says the lead prosecutor in Smollett case. So why allow Smollett to get off for $10K and have his records expunged and case files sealed? Smollett repaid the city $10k, ostensibly as an offset for the investigation his phony charges ignited that cost the City of Chicago in the millions. Simply put, as Crain's Chicago Business' Greg Hinz fumes below, the state’s attorney must look Chicago in the eye and say justice was served. Unfortunately, Cook County State’s Attorney Kim Foxx - a self-styled “reformer” who gained office largely by riding the wave of justified outrage over the Laquan McDonald scandal - appears to have pretty much botched that task in her office’s handling of the high-profile Jussie Smollett case. 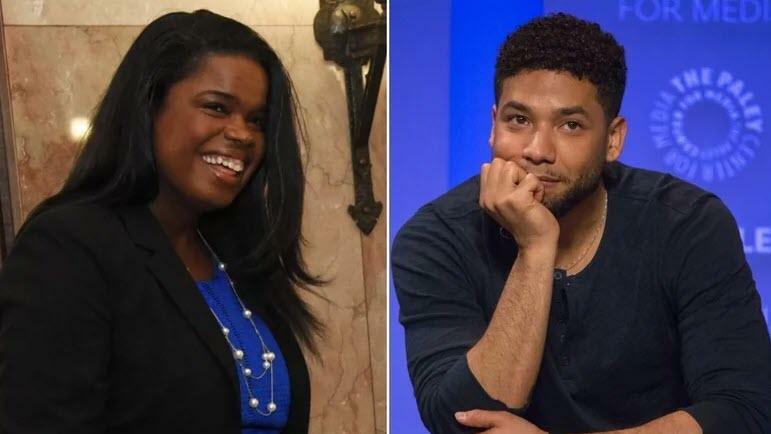 By first intervening with police on Smollett’s behalf and now allowing her top assistant to dismiss a 16-count felony indictment against the tall-tale-telling “Empire” actor with the lightest of slaps on the wrist, Foxx has endangered her political future and, more important, faith in the local justice system. “The office owes the public an explanation,” former Foxx chief deputy Eric Sussman told me in a phone interview late today. The Smollett case has been worldwide news since January. The country and city were rightly horrified by the actor’s story that he’d been accosted by two MAGA hat-wearing attackers he didn’t know who put a rope around his neck, poured a toxic chemical on him and yelled racist and homophobic slurs when he went out for a late-night snack in Streeterville. So, police went all out to find out what happened, assigning what I hear is a mind-boggling 12 detectives full time for weeks to scour tape from remote cameras and other clues. Police finally concluded that the whole thing was a fake and that Smollett’s attackers were actually two body-building acquaintances who’d been hired to do their own acting job. Foxx’s office charged him with 16 felony counts of disorderly conduct, counts that came in the form of a grand jury indictment. By that time, the case already had taken another strange turn. Without detailing why, Foxx recused herself from the case, turning over the matter to her top aide, First Assistant State’s Attorney Joseph Magats. Her recusal came after reports that, after receiving calls on Smollett’s behalf from former top Barack and Michelle Obama aide Tina Tchen, Foxx called Chicago Police Superintendent Eddie Johnson and urged him to turn over the case to the FBI. That’s basically where things stood until today, when in an unexpected and nearly unreported court appearance—the press was tipped by a publicist - Foxx’s office dropped the charges and agreed to seal all of the evidence from public view. What did Foxx's office get in return? Not a confession or even grudging admission of guilt or regret. How about compensation to the city for the hundreds and maybe thousands of hours of police time—time that was badly needed to solve real crimes? Nope. Smollett did a bit a community service—a whole 16 hours doing something or other at Operation Push—and forfeited a $10,000 bond. But Smollett’s lawyer suggested the $10,000 was a token price to uncomplicate his client’s life. So then why did Smollett and his attorney dispute that there was any deal, and act as if, as Donald Trump might put it, he was “COMPLETELY VINDICATED"? Why weren’t city police notified until the last minute? Why is there to be no follow through, no extended conditions to prevent another stunt? In a later interview, Magats insisted the decision to drop the charges was his and his alone. Further, he says, the judge was required to seal the evidence once the defense so requested, state law generally caps compensation in cases like this at $10,000 and the deferred prosecution Smollett’s case involved does not require a confession of guilt. I’m not a lawyer. But now we’ll never know all of the evidence police collected in this case because it’s locked up. And we’ll never see how Smollett would have handled himself at trial, what he would have said under oath, or how he would have explained paying the body builders thousands of dollars. Back to Sussman, who is a lawyer and held Magats' exact job. (A Foxx press aide pointed out that Sussman, a federal prosecutor, was with the office only two years, compared to Magats’ 29). “The prosecution says they have rock-solid evidence, and then they just suddenly drop it?” Sussman asks. “It makes you think there’s some evidence or something that they don’t want out” - perhaps questioning from Foxx about who called her on Smollett’s behalf and what she did about it. But the next time police are reluctant to prosecute a case of gay-bashing... the next time people are afraid to testify against someone with clout... the next time average citizens let gangbangers go free because they’re scared to cooperate... the next time police just don’t want to put in extra effort because they think it’s not worth it... the next time people laugh when you say you’re from Chicago... remember this case. It’s time for Foxx to say lots, lots more about how and why this came down the way it did. I want her to look Chicago in the eye and say justice was served. But we will give the final word to Georgetown Law professor Randy Barnett who asks the question everyone is considering: "None of this is normal - even for Crook County where I was an Assistant State’s Attorney. Educated guess: this hoax implicated someone very important who had pull with the State’s Attorney, and who very badly did not want to be implicated."